What’s it like being an analytical chemist? Senior Britt Turner spent last summer discovering just that with funds provided through the Wake Forest Research Fellowship Program. For several months, he collaborated with Associate Professor of Chemistry Christa Colyer, conducting innovative experiments to determine the selectivity of new dyes and whether one of them would prove more accurate at identifying proteins in a solution than commonly used dyes. “The dyes we used were totally new and were created in collaboration with a research team in Japan,” said Turner, who is from Old Fort, NC, near Asheville. “Professor Colyer and I were the first lab to test them.” Turner conducted experiments and met with Colyer weekly to discuss the results. “Besides mixing solutions for testing, I read literature about other dyes that were used previously in research labs so that I could compare results. But, ultimately, we were in brand new territory with these dyes so there were no equal comparisons. When my results were surprising, Professor Colyer and I would work together to determine if the solution or the methodology or human error might have caused unexpected outcomes,” said Turner. 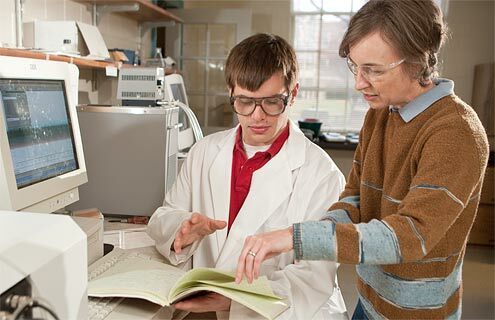 With the grant support, Turner was able to work in the lab five days a week without the additional pressures inherent during the academic year. Instead of spending time securing a summer job that may or may not have been related to his field of interest, he was able to do the kind of work he might one day have a chance to do after graduating. Last fall, Turner traveled to Nashville to present his and Colyer’s collaborative findings at the Southeastern Regional Meeting of the American Chemical Society – a rare opportunity for students to learn what others in the chemistry field are doing and to network. The Wake Forest Research Fellowship Program offers 55 merit-based fellowships to assist students who collaborate with faculty members during the summer. Applications for 2009 fellowships are due no later than March 17.